Consider one of the top officiants in California. We had a little fun putting together this wedding officiant video. We hope you like it. It’s a very short video. 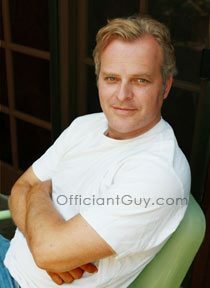 Chris is a great wedding officiant in Los Angeles, and he serves all of Southern California. He also can issue you a marriage license. If you are having trouble seeing the link below, click on the Youtube link: As you can see by the video Officiant Guy is one of the few officiants who has been on TV many times on reality shows and marrying celebrities, so this is a fun video.. When you may love to have a marriage service at any wedding venue in California, contact the very best of officiants. When you both desire a stress-free LA wedding, he can help! Chris has been a marriage officiant for over twenty years. He has made it easier for engaged couples from across the United States and the world. 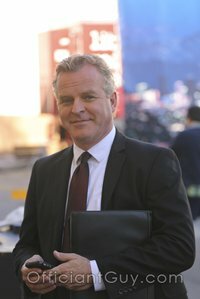 He has gained the respect of thousands of partners as he is a specialized notary, in addition to a non denominational wedding minister, and a CA attorney. Call him right now for your marriage ceremony. In addition he can issue you a marriage license at (310) 882-5039 or (562) 547-3255 or email here.